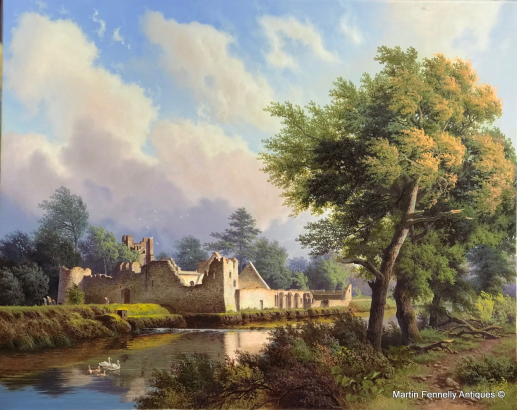 This beautiful Painting by Daniel Van der Putten is a wonderful scene from one of Ireland's most historical Castles at Adare in Co. Limerick, Oil on Board. 'Summer 2018 at Desmond Castle Adare' is a truly majestic painting capturing the beauty of one of Ireland's most beautiful Castles in possibly Ireland's most beautiful village, Adare. Desmond Castle is believed to have been built by William de Burgo in the 12th century. Ownership passed to the Earls of Kildare some time in the middle of the 13th century. It was granted to the Fitzgeralds, Earls of Desmond in 1536 so hence the name. Van der Putten is Dutch born but resides and paints in the UK. Exhibited only in the finest Galleries, it is a great honour to have a Van Der Putten in my Gallery. This Painting shows how Van der Putten's majestic brush work captures with consummate finesse this peaceful and beautiful Summer scene in Adare Co Limerick. Adare is one of Ireland prettiest Viallages and a joy to visit. It is also the home of what some are claimimg to be the most beautiful Manor and Hotel in Europe - Adare Manor.